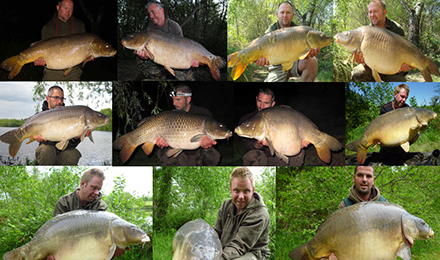 Weekly catch report of Badger’s Holt & Lac Serreire - week 10 - 17 May! "Another great week's fishing on both Lac Serreire and Badger's Holt. On Badger's Holt, Berry Korver and Michael from The Netherlands landed 14 fish including JoJo at 32Kg (70lb 6oz), The Big... Common at 27.2kg (59lb 13oz) and a 25.8Kg ( 56lb 12oz) mirror along with 4 other fish over 20kg (44lb) meaning 50% of the fish were again over the magic 20Kg (44lb) weight! 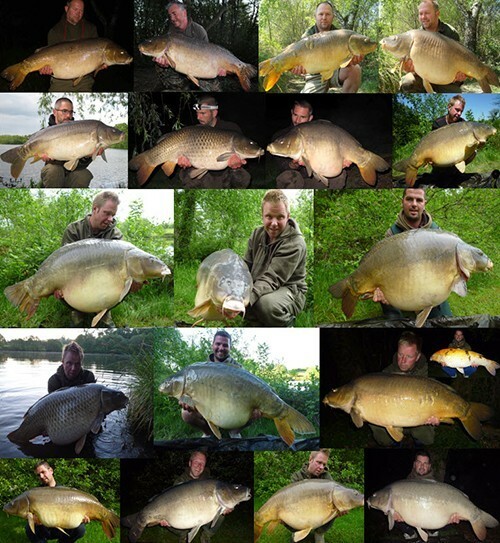 They also landed one of the koi carp at 11.5Kg (25lb 5oz). Congratulations on both smashing your PBs!! Nice fishing - See you next year on Lac Serreire! On Lac Serreire, Barry Coomber and Jamie from the UK had about 10 fish from the shallows and middle swim including a cracking long 54lb 9oz (24.8Kg) mirror to Barry and a 44lb (20Kg) mirror to Jamie. At the other end of the lake, in Tim & Mary's and the Island swims, Rainer and Sasha from Germany had about 8 fish to over 20Kg (44lb). Fishing was hard due to very strong and cold north easterly winds most of the week combined with some heavy rain. Not ideal conditions so all the fish caught were really well earned!"